The plan was for sea_otter and I to head towards Granite Point Wall and explore Middle Reef on the way back. I had some trouble seating my new Deep 6 1st stages that morning which added to the anxiety I was already feeling. I think I may have the "faulty" DIN part that's going to need replacement. We swam out a fair bit past our usual drop point as the surface was pretty calm and dropped around midway up Middle Reef. Rounding the corner, we took a heading and ventured off over the sand. I was surprised how quickly we got to the wall itself - I think I had psyched myself out expecting a much longer swim over featureless sand. The worm patches along the way were pretty helpful for me to orient. Granite Point Wall is beautiful. I think it might end up being one of my favorite/default sites at Pt Lobos. Everything just seems bigger here - the fish, the anemones, even the rocks for some reason. We did an almost complete circuit of the wall and saw a beautiful school of blue rockfish above us, backlit by the sunlight above, when we started to head back. We overshot Middle Reef, ended up at Lone Metridium and then headed back down the west side of the sand channel. 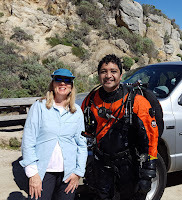 The original plan was do some drills at the Worm Patch before ascending - valve drills for me and stage handling for sea_otter - but after almost 2hr in 49F water, we were both frozen and decided to just end the dive. We did a very slow ascent and I was pretty happy overall with the doubles setup. Great white shark, you say?